Consider these seven National Parks every American should visit, plus recommendations on great places to stay once you decide to go. Nearly 140 years ago, President Ulysses S. Grant signed the act that made Yellowstone the first national park in America. Since then 58 of the country’s most spectacular natural spaces have been safeguarded for future generations to enjoy. Each year, tens of millions of Americans visit the parks, all of which are overseen by the National Park Service. While the majority of the nation’s best-known national parks—Yosemite, Yellowstone, Grand Canyon, Olympic Zion, Rocky Mountain—can be found in the western United States, the most popular park in terms of visitation is Great Smoky Mountains National Park, which straddles North Carolina and Tennessee and welcomes nine million guests each year. The 58 National Parks in America range in size from the Wrangell-St. Elias National Park in Alaska—which at 13.2 million acres is bigger than Switzerland!—to Hot Springs National Park, a bucolic 5,500-acre Arkansas park, whose thermal waters and wooded hiking trails attracted nearly 1.4 million visitors in 2011. To learn more about visiting America’s National Parks, visit the National Park Service website. Why go? Besides being one the most beautiful spots on the planet, its nearly 3,500 square miles of wilderness are home to grizzly bears, wolves, and herds of free-ranging bison and elk. And don’t miss seeing Old Faithful, a spectacular thermal geyser that erupts once every 45 to 90 minutes. Where to stay? 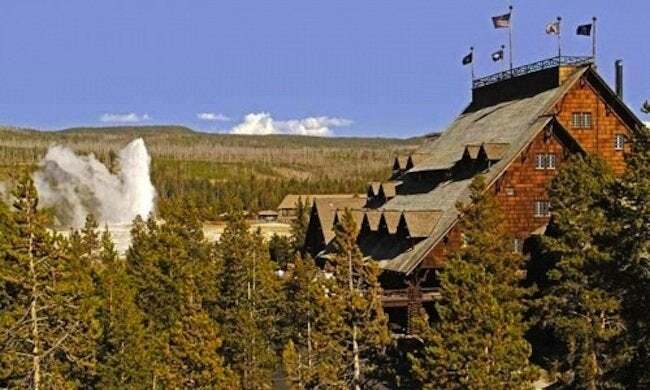 Overnight at Old Faithful Inn, a rustic log hotel with an 85-foot-high stone fireplace in the lobby (from $98 for room w/out bath to $217 for a 2-room suite with bath), or Lake Yellowstone Hotel, the oldest lodging in any national park (from $139). For more information on Yellowstone National Park, click here. Why go? It is 1,200 square miles of wilderness right in the middle of California! There’s Half Dome, a towering granite peak that sits 8,800 feet above sea level; the Mariposa Grove of giant sequoias (the Grizzly Giant is 2,700 years old); and the stunning Yosemite Valley. Where to stay? Overnight at the laid-back Wawona (rooms start at around $150), an old-fashioned family-style hotel nestled under the pines and aspens. For more information on Yosemite National Park, click here. Why go? It’s the only official “natural wonder” in the U.S. Best known for its painted desert and sandstone canyon—and the Colorado River, which surges through the valley. Where to Stay? 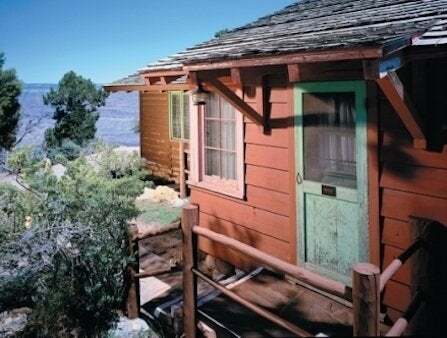 Overnight at Bright Angel Lodge & Cabins, a popular South Rim hotel designed in 1935 by noted architect Mary E.J. Colter. The check-in point for the park’s famous mule rides, the lodge charges $94 for a standard room with bath and $183 for a cabin with fireplace. For more information on Grand Canyon National Park, click here. Why go? You can explore the rugged coast of Maine, climb Cadillac Mountain (the highest peak on the Atlantic Coast), and hike the park’s historic stone carriage roads. Where to stay? Overnight at one of two campgrounds, including Seawall, rated one of the coolest spots to camp in America (from $14 to $20). For more information on Acadia National Park, click here. Why go? You can straddle the Continental Divide, hike more than 300 miles of trails, and see some of the most majestic mountain peaks in North America, including at least 60 peaks that reach an astounding 12,000 feet. Where to stay? Overnight at one of five campgrounds in the park, including beautiful Moraine Park ($20 per night), or book a room at the 1909 Stanley Hotel, a Colorado landmark in nearby Estes Park and the inspiration for Stephen King’s The Shining. For more information on Rocky Mountain National Park, click here. Why go? For the sunsets on Clingmans Dome Road, the wildflowers, the 19th-century Mountain Farm Museum and Mingus Mill, and the chance to cruise along what some consider America’s most scenic byways. It’s also the nation’s most visited national park. Where to stay? Overnight at LeConte Lodge. The only hotel in the park, it’s located at 6,360 feet near the summit of Mt. LeConte (depending on the trail, you may need to hike five to eight miles to get there!) A rustic, hand-hewn lodge room or cabin (plus dinner and breakfast) costs $121 per adult per night and $85 for kids. Two- and three-bedroom cabins that sleep eight to 13 are also available. For more information on Great Smoky National Park, click here. Why go? Everyone should see the park’s magnificent 15-mile-long Zion Canyon and Checkerboard Mesas at least once. Where to stay? 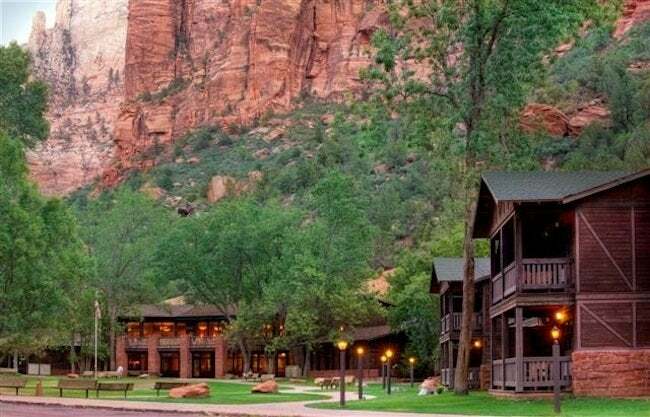 Overnight at Zion Lodge (from $159) or Flanigan’s Inn (from $129), a great small hotel with standard rooms and efficiencies that is within walking distance of the visitors’ center. For more information on Zion National Park, click here.